'You call that a house? How rich we are in the United States that even our barns and sheds have concrete floors? My wealth makes me sick. I could house a family in the space that I take up for myself better than they are housed now.' I thought to myself as I took these pictures. Sam, the man in the white suit jacket started this church you see on the right of the photo above in 1988. Of course the congregation did not have a church when he started it. They even have a blue sign that mentioned it is an Anglican church of the Byumba Diocese. This is how most houses start in the countryside in Rwanda, and likely much of Africa. Basically it looks like bricks around the perimeter and then local clay blocks for the interior walls. Then, I believe, they are covered in an adobe like plaster to give a smooth surface. Totally different building standards. 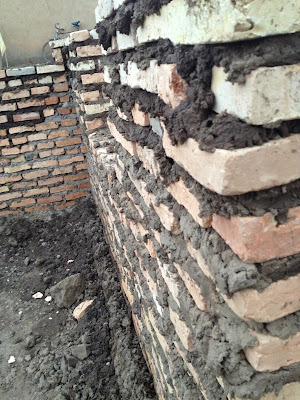 Yes, that is some sort of mud or clay holding those bricks together.